February 13, 2009 / My favourite new feature in WordPress is the built-in “automatic” updater. 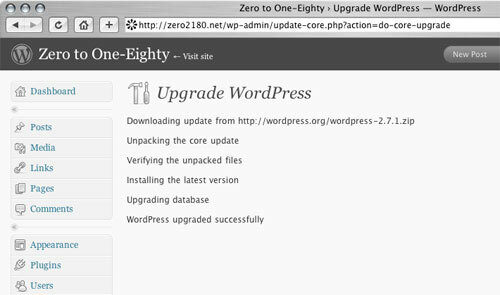 After years of following the extended upgrade instructions for WordPress I was a little skeptical about using the “automatic update” feature in 2.7. But it’s a nice implementation that requires fewer steps and worked smoothly for me. The main difference is the speed of the actual update. It ran in a minute or so. The rest of the time was spent synchronising remote files to the local machine, rather than the other way around. The whole process probably takes about the same amount of time as updating via SVN, but this option will be a lot easier for users who are more comfortable with a GUI than the command line. This is probably the best new feature in WordPress.